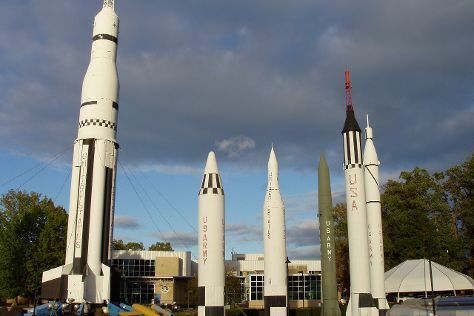 Kick off your visit on the 22nd (Sun): engage your brain at U.S. Space and Rocket Center and then stroll the grounds of Maple Hill Cemetery. To see where to stay, reviews, maps, and more tourist information, you can read our Huntsville itinerary planner. New Orleans to Huntsville is an approximately 5-hour combination of car and flight. You can also fly; or drive. Traveling from New Orleans in September, you can expect nighttime temperatures to be a bit cooler in Huntsville, with lows of 64°F. Finish your sightseeing early on the 22nd (Sun) to allow enough time to drive to Birmingham. On the 23rd (Mon), explore and take pictures at Kelly Ingram Park, get curious at McWane Science Center, then get great views at Vulcan Park and Museum, and finally examine the collection at Barber Vintage Motorsports Museum. Here are some ideas for day two: contemplate the long history of Sloss Furnaces National Historic Landmark, explore the landscape on two wheels at Rotary Trail, explore the world behind art at Birmingham Museum of Art, then get engrossed in the history at Birmingham Civil Rights Institute, and finally take in the spiritual surroundings of 16th Street Baptist Church. To see ratings, reviews, more things to do, and other tourist information, use the Birmingham itinerary planner . Traveling by car from Huntsville to Birmingham takes 2 hours. Alternatively, you can take a bus. In September, daytime highs in Birmingham are 87°F, while nighttime lows are 66°F. Finish your sightseeing early on the 24th (Tue) so you can drive to Montgomery. Montgomery is the capital of the U.S. On the 25th (Wed), contemplate the long history of Dexter Parsonage Museum - Dr. Martin Luther King home, steep yourself in history at First White House of the Confederacy, get engrossed in the history at Civil Rights Memorial Center, then appreciate the history behind National Memorial for Peace and Justice, and finally pause for some photo ops at Hank Williams Statue. On the 26th (Thu), you'll have a packed day of sightseeing: take in the spiritual surroundings of Dexter Avenue King Memorial Baptist Church, get engrossed in the history at Freedom Rides Museum, get engrossed in the history at Rosa Parks Museum, then get engrossed in the history at Hank Williams Museum, and finally stroll the grounds of Hank Williams Memorial - Oakwood Annex Cemetery. For ratings, traveler tips, photos, and more tourist information, you can read our Montgomery trip itinerary site . You can drive from Birmingham to Montgomery in 2 hours. Another option is to take a bus. In September, plan for daily highs up to 88°F, and evening lows to 68°F. Finish up your sightseeing early on the 26th (Thu) so you can go by car to Orange Beach. Fort Morgan State Historic Site and Pottery Central World Headquarters are good opportunities to explore the local culture. We've included these beaches for you: Gulf State Park and Gulf State Park Fishing Pier. There's lots more to do: look for all kinds of wild species at Wildlife Areas, glide through the air with a parasailing or paragliding tour, look for gifts at Chocolate Corner, and see what you can catch with a fishing tour. To see photos, traveler tips, and other tourist information, read our Orange Beach trip planner . Traveling by car from Montgomery to Orange Beach takes 3.5 hours. Alternatively, you can do a combination of bus and car; or do a combination of flight and taxi. September in Orange Beach sees daily highs of 86°F and lows of 69°F at night. Finish your sightseeing early on the 29th (Sun) to allow enough time to drive to Mobile. Mobile is the county seat of Mobile County, Alabama, United States. Start off your visit on the 30th (Mon): appreciate the extensive heritage of Bellingrath Gardens and Home, admire all the interesting features of Battleship USS ALABAMA, then take in the architecture and atmosphere at Cathedral of the Immaculate Conception, and finally take an in-depth tour of Mobile Police History Museum. To see more things to do, ratings, reviews, and other tourist information, refer to the Mobile tour itinerary planner . Drive from Orange Beach to Mobile in 1.5 hours. Expect a daytime high around 88°F in September, and nighttime lows around 72°F. Finish your sightseeing early on the 30th (Mon) so you can drive back home.